CJ’s on the Bay is different than your average, inland dining experience. The restaurant's waterfront access welcomes boaters from all across the bay, enjoying its stunning ocean views and all-day menu both on-the-go and over hours of relaxation. From fresh seafood favorites like coconut shrimp, stone crab and oysters, to their Upside Down Nachos or hand-whipped hummus, there’s light appetizers for everyone. Their lunch and dinner menu is even more robust, featuring a long list of soups and salads, sandwiches, pasta dishes suited for most palates. 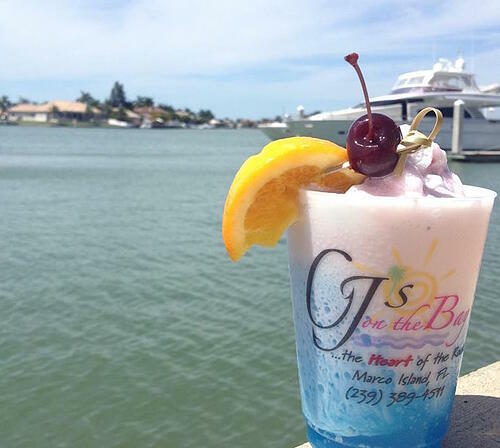 With the largest outdoor gazebo bar on Marco Island, as well as an air-conditioned interior bar, it’s a wonderful place to sip daiquiris and overlook the beach. Pair it with their live entertainment every Thursday through Saturday and pet-friendly outdoor seating and it’s a lively evening escape.